Heidi SQL has this part implemented more then perfectly. Can you please elaborate a bit more on the second point? Which specific Save As Script are you referring to? A brief example of how to save and how to save it using INSERTs, UPDATEs, MERGE (INSERT ON CONFLICT) would be very helpful. Sorry I'm not familiar with Heidi SQL, don't know how it's implemented in that tool. Here is example screenshot of mentioned feature. of course, it works with data collected in datagrid by selecting them prior to choosing this feature. As you can see, you can export grid content to file as well as store it to clipboard, making possible to paste it anywhere quickly. Current version of SA offers saving to file only. Of course I'm not asking to copy all possible features of other software, but found SA is missing ability to create updates/merges in quick way. Couple of tips you may find useful. There is an option in the Script Table Data dialog to "Output script to new code pane" so that a file is not required, it's optional. You don't even need to paste it and you can script data in multiple tables at once. 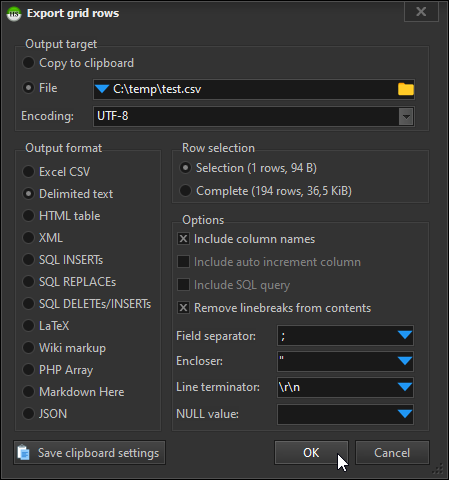 The encoding is always utf-8, but if you want to convert it to something else, you can use File menu in the SQL Editor and then File Encoding, Character Set and File Format options to convert it to something else. 'INSERT INTO "$OBJECT(ins_schema, table)$". "$OBJECT(ins_object, table)$"
The output of this template would be a bunch of INSERT statements with ON CONFLICT clause referring to table's primary key constraint name and DO NOTHING action. Never went for scriptable code snippets. It looks to be worth to try.